Cancer was once a word uttered soto voce, a word so dangerous it would conjure demons and visions of the Spectre of Death. A barely-known radiologist named Marjorie B. Illig helped to change that, and the women of Donora readily jumped aboard her world-changing vision. Silver Lining deals with the people and events related to the Donora (PA) Death Fog of 1948, a tragedy in which 20 people died and which led directly to the nation’s first Clean Air Act. In this blog I provide information about the event, historical context, and lessons we can learn today. Where Did the Smog Victims Live and Die? Who Died When in Donora’s Death Fog? 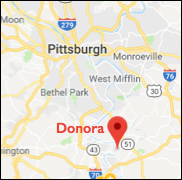 Could Donora Happen Again? Here in the US? Do You Know Any of These Donora Smog Victims? Who Died in Donora’s Deadly Smog? Who Was William Donner, the Man? Andy McPhee is the author of nine health science books and more than 750 news articles for mid-teens. A former RN, he was a publisher for a major healthcare educational publisher in Philadelphia. He is an avid golfer, reader, and grandfather.